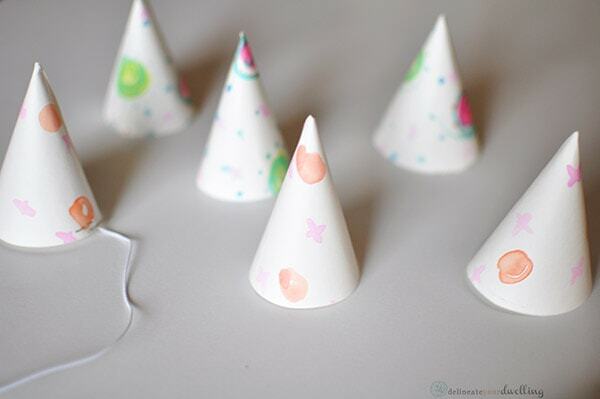 How to make simple Sprinkle Birthday Party Hats. 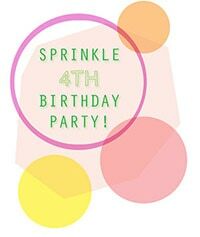 Today is week two of a Monday mini series of my Sprinkle Birthday Party DIYs. My big girl, kiddo #1 just celebrated her fourth birthday. I adore celebrating my babies on their birthdays and making them feel special. However, birthday parties can quickly get out of control and you can spend hundreds of dollars on decor, favors, cake, activities, etc. I went the DIY route this year and without spending much at all, I think this was one of my favorite kid’s parties to date! 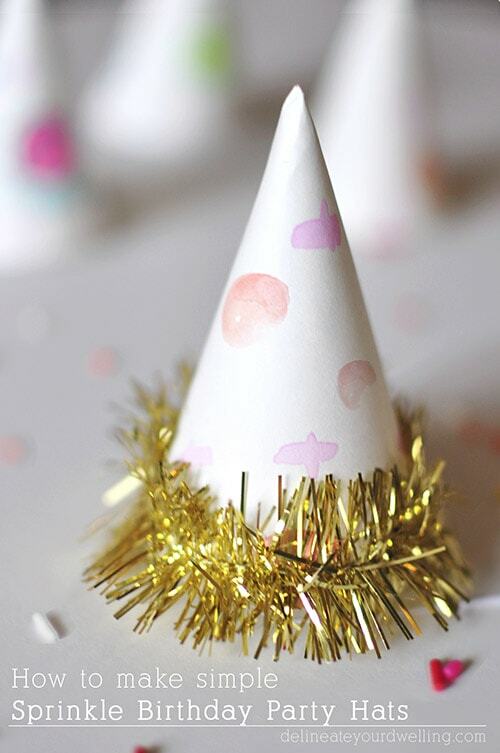 We went with a Sprinkle Party theme and today I am sharing How to make simple Sprinkle Birthday Party Hats. 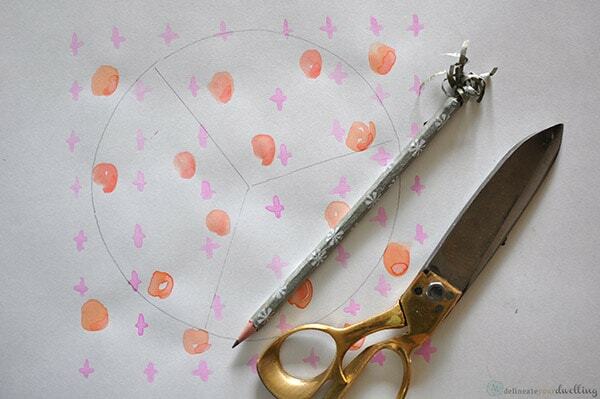 After painting simple watercolor patterns on sheets of paper, I traced a circle about 7″ in diameter. Then, divide the circle into three equal sections. 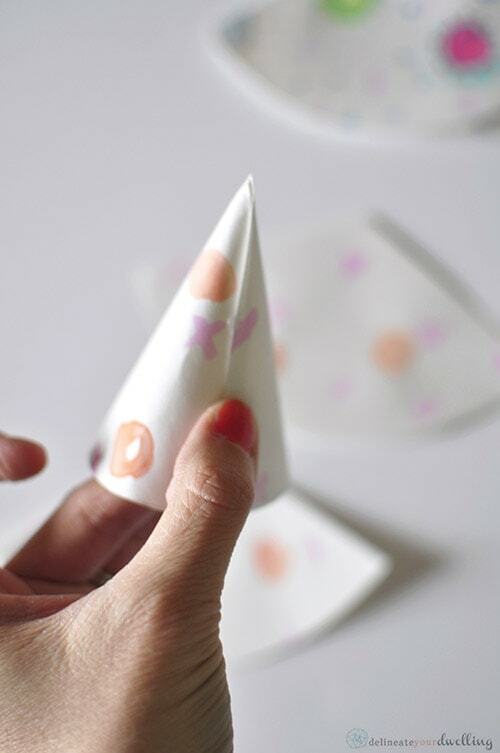 Cut each section out from the circle and use a small dot of hot glue to secure. I made six hats and they all were so adorable. 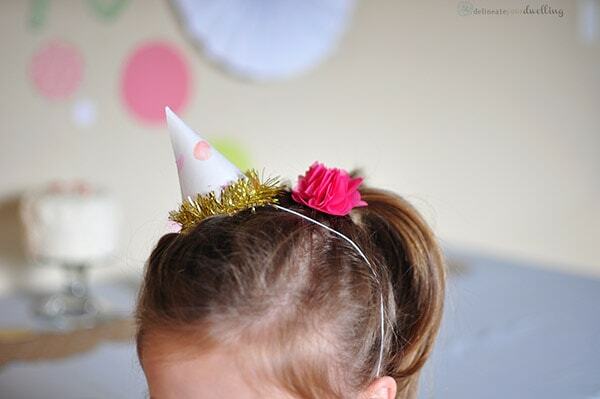 The birthday girl’s hat then got a small gold garland embellishment. Measure out the elastic length needed for comfortable hat wearing and secure to the hat with a staple. I also added a bit of hot glue for extra holding power. Kiddo #1 was SO THRILLED with these hats! 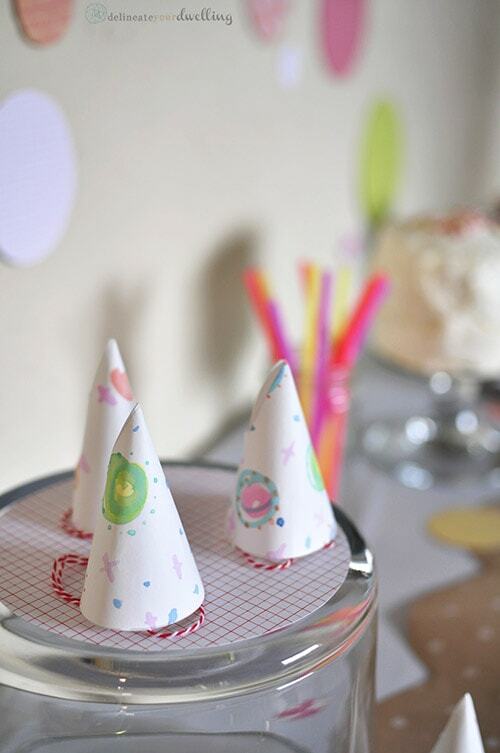 These were such easy DIYs and wearing Sprinkle Birthday Party Hats definitely excited the children! I was so happy I had put in the hour of effort to make them. 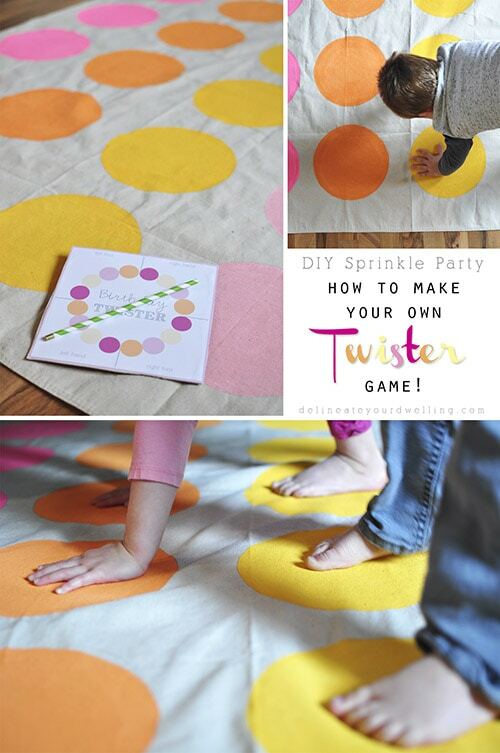 If you liked this DIY, you might also enjoy our DIY Twister game! 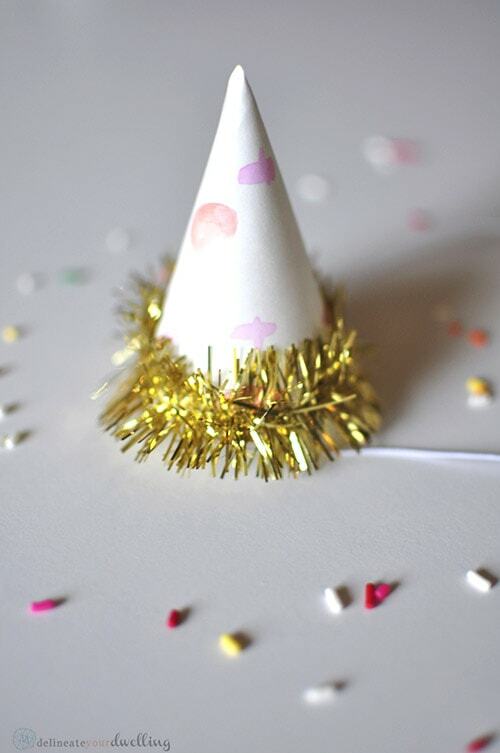 the party hats, Sprinkle Cake tips and the final reveal! They are soo adorable! A great idea instead of store bought too! Adorable! I need to remember this! Ah, thanks Kendra! 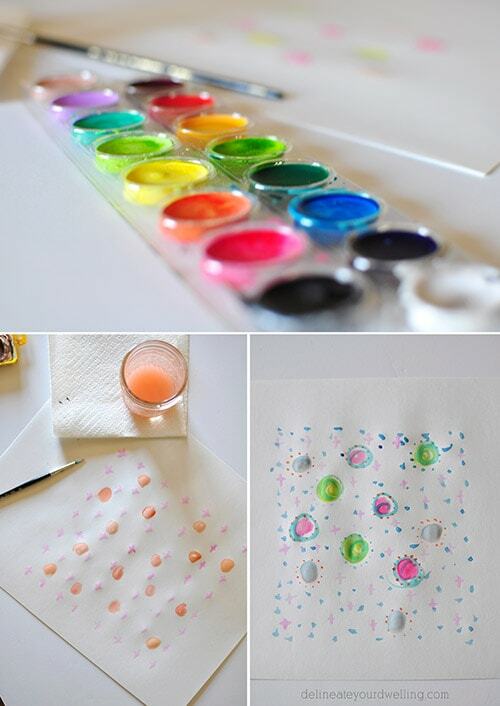 They were really fun to make!! I totally wore one for a while, too. Ha. Thanks Emily! They were so fun to make. Thanks Vanessa, they were so fun to make! !